Pocono TreeVentures will operate in the rain but may suspend operations during the day of your visit if there is lightning in the general area. If we have lightning within a 30-mile radius of the park, the park goes on "Lightning Hold." This means we will allow guests to continue to the end of the course they are currently traversing. In the event of lightning within a 15-mile radius of the park, we clear all courses immediately. Guests in the middle of a course will be assisted to the ground by the TreeVentures guide staff. All guests will wait for the storm to pass in the registration area or their vehicles. The course will not be open in storms with high winds or thunder and lightning. If we cannot resume operations within 90 minutes, guests will be issued a return voucher if they have more than a half hour left on their ticket. We do not extend refunds once guests have started the course. 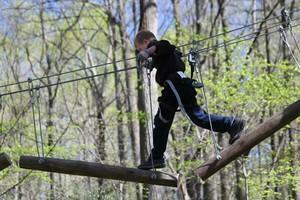 Both the TreeVentures Ropes Course and Zip Racer are open year-round weather permitting. Call for current course conditions 800-446-0231. Wear appropriate clothing for being outdoors in the weather. Please note that poor weather where you live does not dictate course closing. Call before leaving home if you have concerns about the weather. In some cases, the course may be closed temporarily to allow for weather systems to pass. We strongly suggest you complete the consent and waiver form in advance to save time at check-in. Please be sure to wear closed toe shoes - no sandals or flip flops allowed in the trees. Be at least 7 years old and 42” tall to 80" tall weighing more than 50 pounds and less than 265 pounds with sound body and mind capable of performing specific safety tasks independently and be physically able to grasp and pull ropes, climb and balance and not have an extreme fear of heights. Clothing that our staff considers to be inappropriate (including but not limited to bathing suits) will not be permitted. Be at least 4 years old and physically able to grasp and pull ropes, climb and balance with adult supervison at all times. Get specific training in all safety and permanently installed equipment in the park. Execute a parent or guardian signed waiver. No sandals or flip flops, wear secured closed topes shoes or sneakers. Obey instructions given by Tree Staff. When in doubt, ask Tree Staff for assistance. Guests must sign a release. Anyone under the age of 18 must also have the signature of a parent or guardian. A beginner level ropes course must be used before going on any higher level course. Except for KidVentures. Weigh between 50 and 265 lbs, fit comfortably in the provided safety harness, and have a reach of 55 inches measured from the sole of the foot to the up-stretched tips of fingers. Except for KidVentures. All guests must be prepared for light exertion, be able to walk in the woods and climb stairs unassisted. Pregnant women, people with heart, leg or spine problems or other serious conditions or persons unsure of their physical ability should consult their personal physician first. No sandals or flip flops, wear secured closed toed shoes or sneakers. No profanity allowed in course. Obey instructions given by our Tree Staff. When in doubt, ask our Tree Staff for assistance. The management reserves the right to ask anyone in breach of these rules to leave TreeVentures. During extreme weather conditions, you may be asked to evacuate.